Where does the body end? Exploring the material and metaphorical borderline between flesh and its accompanying technologies. Prosthesis-pointing to an addition, replacement, extension, enhancement-has become something of an all-purpose metaphor for the interactions of body and technology. Concerned with cybernetics, transplant technology, artificial intelligence, and virtual reality, among other cultural and scientific developments, "the prosthetic" conjures up a posthuman condition. 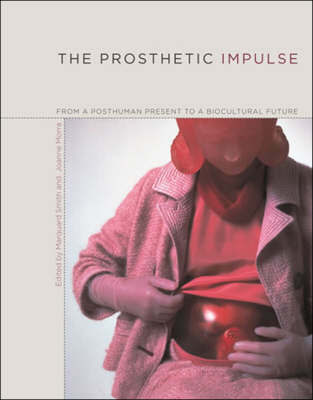 In response to this, the 13 original essays in The Prosthetic Impulse reassert the phenomenological, material, and embodied nature of prosthesis without dismissing its metaphorical potential. They examine the historical and conceptual edge between the human and the posthuman-between flesh and its accompanying technologies. Rather than tracking the transformation of one into the other, these essays address this borderline and the delicate dialectical situation in which it places us. Concentrating on this edge, the collection demonstrates how the human has been technologized and technology humanized. The eclectic approach taken by The Prosthetic Impulse draws on disciplines ranging from gender studies, philosophy, and visual culture to psychoanalysis, cybertheory, and phenomenology. The first section, "Carnality: Between Phenomenology and the Biocultural" concentrates on the organic, describing a body that, by its very materiality, is always and already prosthetic. The second section, "Assembling: Internalization. Externalization," considers the technological qualities and peculiarities of prosthesis, raising questions about the ways in which film, photography, AI, drawing, and literature-representation itself-can be situated within the framework of a prosthetic discourse. Taken together, the essays suggest that prosthesis is material as well as metaphorical. "It is just a matter of pondering where the inelegant edges lie," the editors write, "and living them most wonderfully."